One of the reasons I love Pinterest is the ideas it gives you. 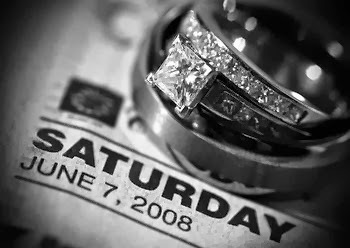 One night I found a pin with wedding rings on the newspaper and thought great idea! I immediately pinned it and added to the comment 'get the newspaper on wedding day, on the To Do List!' Even with a million things going on, on the morning of my wedding my brother was running out to get milk from the store and asked "Does anybody need anything?" "Yes!!" I shouted. "Grab today's paper!" 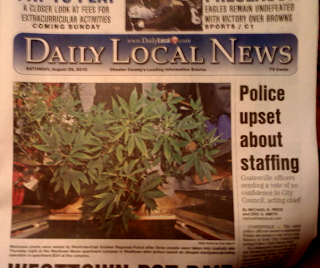 YUP, Pot Raid on the front page of the newspaper. I thought "guess we won't be getting any nice pictures of our rings with this newspaper."